Almost any packaged item we consume has an ingredients or nutritional label, even bottled water. But not beer—until now. 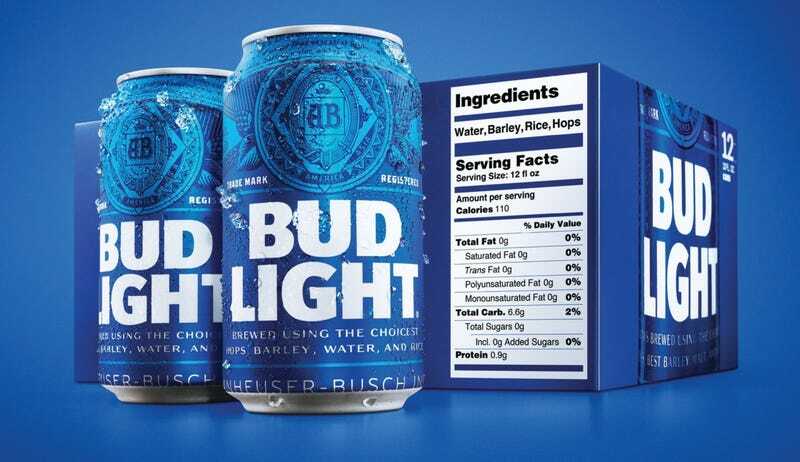 Anheuser-Busch InBev announced today Bud Light will be the first American beer sold in a package containing a list of ingredients and serving facts. The new packaging is expected to hit shelves in February. According to a press release, in addition to an ingredients list (water, barley, rice, hops), the label will list serving size, calories (110 per 12-ounce can), total fat, saturated fat, trans fat, carbohydrates (6.5 grams), sugars and protein. A spokesperson for Anheuser-Busch tells The Takeout the labels will appear on secondary packaging—so, not the bottles or cans themselves—of Bud Light 6-packs, 12-packs, and 24-packs. The company is touting this new package as a victory for “increased transparency,” but it’s also a smart competitive move. Anheuser-Busch InBev is probably betting that some consumers—ones who are already considering light beer—will be pleased to see that 110-calorie number on the label. Anecdotally, I’ve noticed that drinkers of hard seltzers like White Claw and Truly Spiked often cite its 100-calorie count as a major factor in their decision to buy it. Of course, most craft beer drinkers aren’t under the assumption that their favorite IPA is a health food. But large beer companies are betting that there are enough consumers who will be swayed by the lower calorie counts to make it worth listing those on packaging. In July 2016, the Beer Institute—a trade group representing big beer companies like Anheuser-Busch, MillerCoors, HeinekenUSA, Constellation Brands Beer Division and others—announced its Voluntary Disclosure Initiative, a commitment to adding a serving facts statement and freshness code dating to all participating breweries’ beers by 2020. The Insitute’s members, who make up 81 percent of the beer volume sold in the U.S., signed on to participate. Bud Light may have led the charge on ingredients and nutritional info on beer labels, but it’s only a preview of what’s to come from some of America’s biggest beer brands.